The Khaled bin Sultan Living Oceans Foundation announces that Riley Samels from Ohio is this year’s Science Without Borders® Challenge winner. 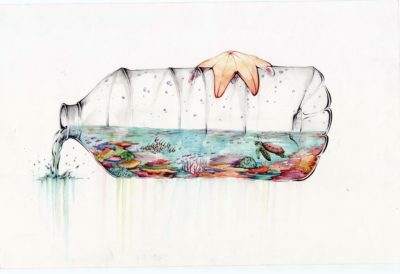 His stunning art work ‘Reef in a Bottle’ beat out the fierce competition to take first place. 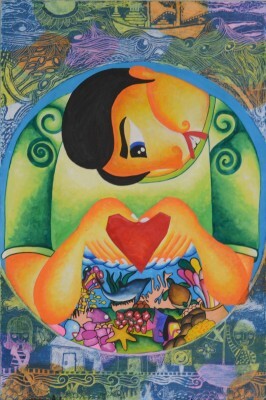 The Challenge is a yearly science competition that is designed to engage secondary students in ocean conservation through art. This year’s theme was Protect Our Coral Reefs and the judges were overwhelmed by the sheer number and high caliber of entries from all over the world. Some of the themes addressed in the art works were overfishing, pollution, anchoring on coral reefs, bleaching, and ocean acidification. Through this competition, the Living Oceans Foundation hopes to promote public awareness of the need to preserve, protect, and restore the world’s oceans and to inspire many students to conserve and protect coral reefs around the world. Second place went to Anika Biene Padrigo from the Philippines and joint third place was awarded to Kang San Kim from South Korea and Hiba Khamlichi from Morocco.